Multiple Gods in Hinduism, Polytheism or Monotheism ? Common notion about Hinduism is that there are multiple gods and infact there can be millions of them. But in reality, there is only ONE god and rest are not gods but dieties (devas or demi-gods). The word Deva means, the one who shines. So, all illuminated souls have been given some powers and also responsibilities to function in this creation. There is only one god and there is no image for him but he can take any form or can take many forms (Avatars). So, from this statement, lord Vishnu and his avatars (Krishna, Rama) are one and the same and so, is worshipable in any form. Lord Krishna shows his Vishwaroop darshan to Arjuna. (vishwa swaroop means that the original form of the supreme god expands over the whole universe and so, in full, is not visible to anyone). If you see above, heads of all deities are attached to lord Krishna (Vishnu) head. So, lord Krishna indicates arjuna that number of such deities attached in form of my head spans up to millions. So, his full image cannot be seen by human. He also indicated that all deities are his manifestations and everything is derived from him. All these deities are the manifestations of one supreme God ( Brahman). 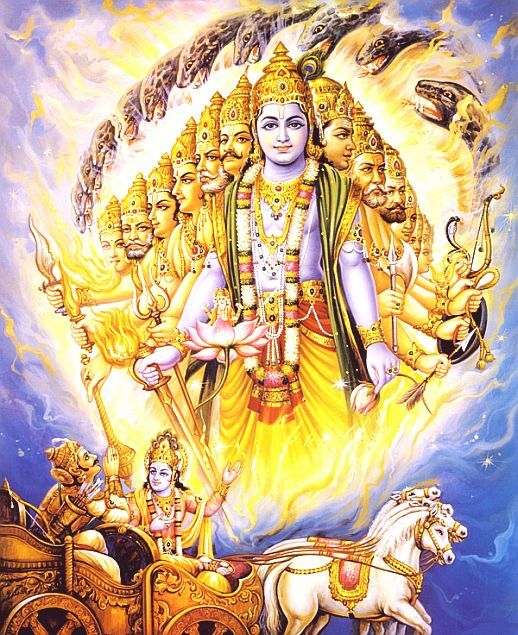 Other multiple gods in hinduism have been created by the supreme god to maintain the different department of universe. Indra Handles the department of rain, Agni handles the department of fire, Varuna handles the water department etc. All devas like Brahma, Vishnu, Siva etc have certain lifetime and after that other illuminated souls will take their position for this galaxy. In other galaxies, there can be other deities, which was explained in Devi Bhagavatam that multiple Vishnus, multiple Sivas and multiple Brahmas exist across galaxies. Ek sadviprâ bahudhâ vadanti Agni Yama? Mâtariúvânam âhu -Rig Veda (1/164/46).